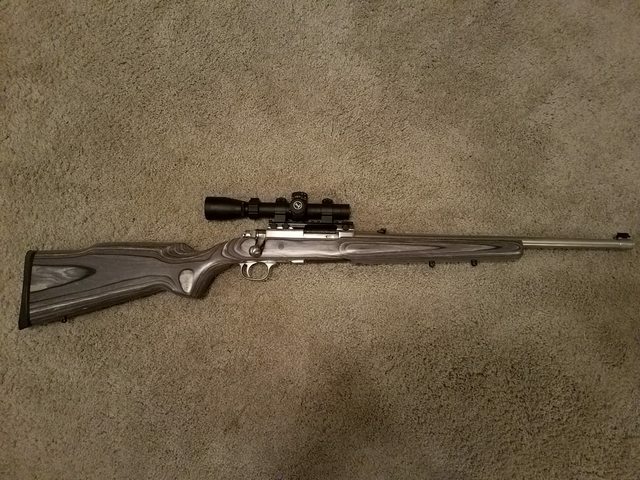 I decided not to trade my Henry Big Boy steel for a Ruger 77/357. I bought one at an auction for $380 with the buyers fee. The out of the box trigger was pretty bad, 5 pounds 7 ounces and mushy. Picked up a Volquartsen sear and trigger spring, installed, dropped the trigger to 2 pounds 14 ounces with a very clean break. 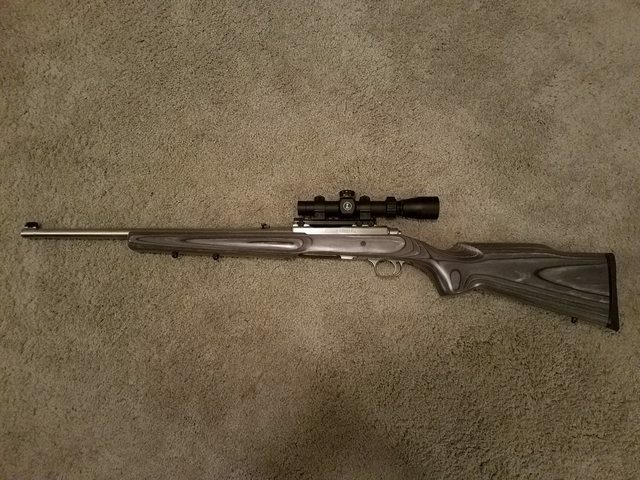 Since I had it out of the stock, I swapped the plastic one for a Boyd's Pepper laminate hunter stock. Looks a lot better. Installed a Weigand rail and for now a Leupold 1.5-4 Mark AR Mod 1 scope I had laying around. I will probably put a fixed 2.5 scope like the one on the single shot 357 Maximum. Total into the rifle is about $740. Going to load up a bunch of mid to heavy bullet hunting loads to test this weekend. The goal is a loading usable on hogs or deer out to 100 yards max. Bagged a hog with this one too. a 150 to 160 pound boar. used a 180gr Federal Swift A frame. Lung shot from the side, at a paced 60 yards. Complete penetration, didn't find the bullet. Blood trail a blind man could follow and the hog ran off about 150 yards. Nice looking rifle. First that i have heard of the 357 Maximum cartridge, neat looking round. Gratz on the hog. It was developed to be the hot, flat-shooting round for metallic silhouette competition. With 125 gr bullets, it developed a bad reputation for flame-cutting the top strap of revolver frames, and therefore mostly faded away. The Rifle in this thread is a 357 Magnum. The Henry is the first winter project tread is the 357 maximum.